In 1995, a little company called Binary Research introduced a little software program called “Ghost“, which allowed cloning of a disk. This technology, which was based on an earlier movie, was later acquired by Symantec, who turned in into one of the most successful disk cloning programs. It was so successful, in fact, that some theatrical producers in London came along and decided to turn this story about disk cloning into a musical. And thus, “Ghost the Musical” was born. And so, when I heard that a musical about backup software was coming to Los Angeles on tour, the computer security specialist in me just had to see it. As a result, this afternoon saw me at the Pantages seeing “Ghost: The Musical“. Imagine my surprise when I discovered it wasn’t about backup software, but rather a technology-heavy cloning of the 1990 movie starring Patrick Swayze, Demi Moore, and Whoopi Goldberg. However, it was about cybersecurity — if there is a lesson to be learned from “Ghost: The Musical“, it is to protect your access codes and never to share them. To be serious for a minute, I actually knew that “Ghost: The Musical” was a stage version of the 1990 movie, which I had never seen. I had heard the cast album from the show and it seemed somewhat reasonable, and it conveyed the story well. So even though it might be a a chick-musical, I decided I should see the story to go with the music. It had only lasted on Broadway for 136 performances, but there are other shows that I like that had flopped on Broadway, so what could go wrong? As I talked about the show with my wife afterwards, I shared with her a number of conclusions about the show — which I’ll share in a minute. While writing this entry up, I read the Broadway reactions to the show. Turns out my comments (which you’ll see in a few paragraphs) agreed pretty spot-on with the New York critics. Would I recommend this show to others? If you are a fan of the movie, you’ll enjoy it. If you are a fan of quality musicals, you’ll find it average but not a stinker (I’ve seen “Caligula: The Musical“, so I know stinkers). Will it have an amateur afterlife? Alas, it may, but only after a lot of reworking — and like Sam Wheat, it may have more substance in the afterlife than it had when it walked this earth as the real thing. The story of “Ghost: The Musical” appears to follow the movie plotline pretty closely. Some characters appear to have been eliminated, some scenes reordered, but the basic story is there. Sam, a banker, is in love with Molly, a potter. Sam can’t quite tell Molly he loves her, though. Sam discovers some discrepancies in the accounts he manages. His friend, Carl, offers to investigate, but Sam changes the account codes and tells Carl he’ll investigate himself. That evening, a thug attacks Sam and Molly for Sam’s wallet, and Sam is killed in the struggle. He returns as a ghost, and the rest of the movie, oops, musical is about Sam trying to get in contact with Molly to inform her about his killer and bring him to justice. He does this through a psychic named Oda Mae Brown. Twists and adventures about, and key movie scenes are recreated including the infamous parodied pottery scene, which is very short, seems to add nothing to the story other than the novelty of an actual potters wheel on the Pantages stage. I think you can seen the predictable ending: Sam works with Oda Mae to uncover the real killer (Carl, if you hadn’t guessed), convince Molly that he was really there only in time to complete his task and disappear. Que sloppy and sappy ending. The story itself wasn’t as bad as I made it out to be. There were some comic moments in the second act that I hadn’t seen coming and were well played. The problem is that it wasn’t musicalized very well. My understanding of musicals is that (a) the music should serve to advance the plot (except for retrospective jukebox musicals), (b) you should walk out with music that you remember, and (c) there should be some form of character growth. This show was the product of Dave Stewart, Glen Ballard (both Music and Lyrics), and Bruce Joel Rubin (Book and Lyrics) (who had done the original screenplay). Translation: You had a story being musicalized by two who were familiar with rock music and not theatrical music, and a theatrical book being done by someone who had only written screenplays. Again I ask, what could go wrong? I mean, there are rock musicians who can write great theatre scores — witness Sir Elton and Cyndi Lauper — and there are screenwriters who can do stories for the stage (look at Aaron Sorkin). So what could go wrong? The resulting musical had a heavy rock score, which just didn’t fit the story and lent itself to heavily choreographed dance sequences that had nothing to do with the story (making them worse was the fact that the choreography of Ashley Wallen (FB) came across as mechanical and disconnected, instead of integrated and fun). There were internal points that could have been musicalized well — and one or two were — but the songs just never hit home and stuck like a good theatrical song does. My best example of this was song “I’m Outta Here”, which was just pointless. What about how the story was translated to the stage? A good playwright understands how stage is different — how you have to suggest things and bring the audience into the imagination of the story. The Fantastiks is a great example of that. Here, sad to say, technology was used to create a movie on stage. There was heavy use of projections — both in the background and as a front scrim. These backgrounds had heavy movements and LED acrobatics that essentially put the movie on stage projected, as least in scenic areas. This created a very heavy dependence on technology that I feel hurt the play — it moved the production away from the imagination that the stage requires into the realism of the silver screen. If I want realize, I’ll go to the movies. I go to the theatre because I want actors to create the story out of nothingness. Where should be blame be placed here? Some goes on the screenwriter, oops, playwright. More, I feel goes on the director, Matthew Warchus, who had the charge of taking the vision from paper and putting it on stage (and this gets me worried about Matilda: The Musical, which he also directed). In a good play or musical, the director disappears into the acting — what is on stage seems a natural way to tell the story and the actors tell it. Here the choice to depend so heavily on technology overpowered (just like the musicians overpowered the vocals), making the directorial choices stand out. It will be interesting to see how this musical improves when it moves to the amateur and regional arena, where the technology just won’t be there. Perhaps it will work better then. That doesn’t mean the musical was horrible, however. The basic illusions, designed by Paul Kieve, were excellent. Even though you knew the actor playing Sam had physical substance, the illusions and choreography of his movements made you believe he couldn’t interact with normal matter. There were little tricks and sequences that just brought that illusion to, so to speak, life. There was also some wonderful interaction with the technical displays that worked extremely well. Also strong were the lead actors. The two primary leads — Steven Grant Douglas (FB) as Sam Wheat and Katie Postotnik (FB) as Molly Jenson — sang well and had a delightful believable chemistry between them. They were, to put it succinctly, cute together. Douglas created the illusion of being a ghost extremely well, and Postontnik handled the grieving girlfriend well. She even knew how to work the potters wheel (I wonder if that was in the casting requirements, just like Douglas being able to play the guitar). In the third lead position was Carla R. Stewart (FB) as Oda Mae Brown. She handled the comic aspects of the role well, but was overpowered in her main numbers by the orchestra. I fault the sound guy for that (either the orchestra was over-amplified or she was under-mic-ed), and she should as well. When we could hear her voice, it was good. As for the rest of the cast, well, you really didn’t get to know them well. The few named other characters — Robby Haltiwanger (FB) as Carl Bruner, Fernando Contreras (FB) as Willie Lopez, Brandon Curry (FB) as the Subway Ghost, Evette Marie White (FB) as Clara, Lydia Warr (FB) as Louise, Hana Freeman (FB) as Mrs. Santiago, and Shannan E. Johnson (FB) as Ortisha — have their moments but never become real characters. The closest you come are Carl Bruner and Willie Lopez, but the latter is a stereotypical hispanic thug, and the former is a stereotypical slime banker. As for the ensemble, they basically serve as a glorified dance troupe during scene transitions while the main cast members change or the set changes. I’m not saying that one expects individualization from the ensemble, but you do expect the ensemble to support the story, to play out characters you might never meet, to give some acting behind the dance. I’ve seen this in other large musicals I’ve seen. Here — and again I blame the director and choreographer more than the performers who were just following instructions — we had dance sequences of ghosts, or business people in suits, or people on the street with umbrellas — that were amplified by LED dancers in the background and choreographed with technically precise rock-ish dance moves. It just didn’t work. The ensemble consisted of: Fernando Contreras (FB), Brandon Curry (FB), Hana Freeman (FB), Shannan E. Johnson (FB), Susan Leilani Gearou (FB), Tony Johnson/FB, Beth Stafford Laird (FB), Andrea Laxton (FB), Ben Laxton (FB), Jake Vander Linden (FB), Michael McClure/FB, David Melendez/FB, Jack O’Brien/FB, Maria Cristina Slye (FB), Lydia Warr (FB), Evette Marie White (FB). I’ll also note that this, alas, was a non-equity tour. This is poor form, as tours are hard work, and equity tours provide important protections to actors. I’ve commented before on the quality of the score. The score was executed by a 14 member orchestra under the direction of Matthew Smedal. Music supervision was by David Holcenberg, and Talitha Fehr was music coordinator. Christopher Nightingale was the musical supervisor, arranger, and orchestrator. The major complaint with the music was that it was overamplified — this is a musical, dammit, not a rock concert! Turning to the technical and the remainder of the creatives. The set was designed by … hmmm, there’s no credit for a set designer, only an associate scenic designer (Paul Weimer).There is, however, a credit for video and projection design (John Driscoll), as well as an associate (Michael Clark). This says quite a bit — there really was no set design. There were hints of sets — a couch here, a sign there, a refrigerator, a pottery wheel, a desk. The rest was all projections. Although use of projections is understandable in a tour, the sets in this show were so dependent on the projections that the magic of stagecraft was lost. The lighting was designed by Hugh Vanstone, and recreated by Joel Shier. The lighting made heavy use of moving lights and LED lights, constantly rotating into the audience. Remember what I said about this being theatre, not a rock show? This was rock show lighting, and I think it hurt the production. Sound was by Bobby Aitken, and Garth Helm, with assist from the UK’s Simon King. Looking at Aitken’s resume, you can see the problem by now — he is a rock show sound designer, and the musician’s sound overpowered the actors voices. Again, there is no credit for costumes, but there is an associate costume designer (Daryl Stone); hair, wigs, and makeup were by Campbell Young Associates. Both were satisfactory. Rounding out the creative team were Thomas Caruso (Associate Director), Paul Warwick Griffin (Associate Director), Sunny Walters (Associate Choreographer), Ryan P. Murphy (Production Manager), Townsend Teague (General Manager), and Donavan Dolan (Production Stage Manager). 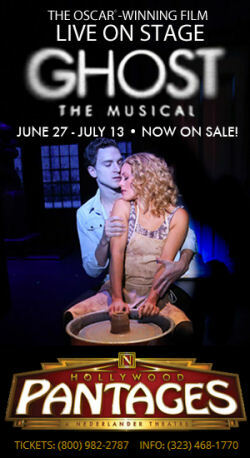 “Ghost: The Musical” continues at the Pantages through July 13. Tickets are available through the Pantages Box Office, as well as through Goldstar. Upcoming Theatre and Concerts: Next weekend sees us back in Santa Clarita for “Return to the Forbidden Planet” at REP East (FB) the weekend of 7/12 — the artistic team must have had a ghost advising them, for it was just announced that the Oliver-award-wining Forbidden Planet will be starting a 25th Anniversary Tour. See it now, upclose and personal! That will be followed by “Once” at the Pantages (FB) on 7/19, “Bye Bye Birdie” at Cabrillo Music Theatre (FB) on 7/26, “Family Planning” at The Colony Theatre (FB) on 8/2, and “Buyer and Cellar” at the Mark Taper Forum on 8/9. I’m hoping to follow that with “Broadway Bound” at the Odyssey for 8/16. We then deal with vacations, but I’m eyeing a number of productions in Escondido, including “Two Gentlemen of Verona” at the Old Globe, and “Pageant” at the Cygnet in Old Town. What they have at the Welk (“Oklahoma“), Patio Theatre (“Fiddler on the Roof“), and Moonlight Stage (“My Fair Lady“) are all retreads. Things start to get busy again in September and October, with “The Great Gatsby” at REP, “What I Learned in Paris” at the Colony, and “Pippin” at the Pantages. More on that later. As always, I’m keeping my eyes open for interesting productions mentioned on sites such as Bitter-Lemons, and Musicals in LA, as well as productions I see on Goldstar, LA Stage Tix, Plays411.